In our villas and tents, art lovers will find delight in the authentic and original pieces of art, designed by our hand-picked selection of Thai artists. We pride ourselves on offering one-of-a-kind experiences for our guests who are visiting Koh Samui for business or leisure alike. Discover the plush amenities featured in our chic boutique and gallery resort and enjoy a stay in one of our exclusive villas each decorated with the help of a different original Thai artist. Each pool villa and tented villa is an exhibition in its own, a pleasure for our guests’eyes and soul, for the best of relaxation in Koh Samui, Thailand. Bird is a Thai painter who loves to play with light and work on textures suchas bamboo and gold leaves. His paintings catch your eyes and plunge you into a deep contemplation. And soon, you will wonder whether you are watching the painting or… couldthe painting be watching you ? Lek is a Thai painter and as a tribute to his culture, he dedicates his work to “changs” (elephant in Thai language). Artist and technician, he masters the material like no one. His expertise serves a deep meaning and the viewer will necessary falls into deep introspection while observing the elephants facing the elements. 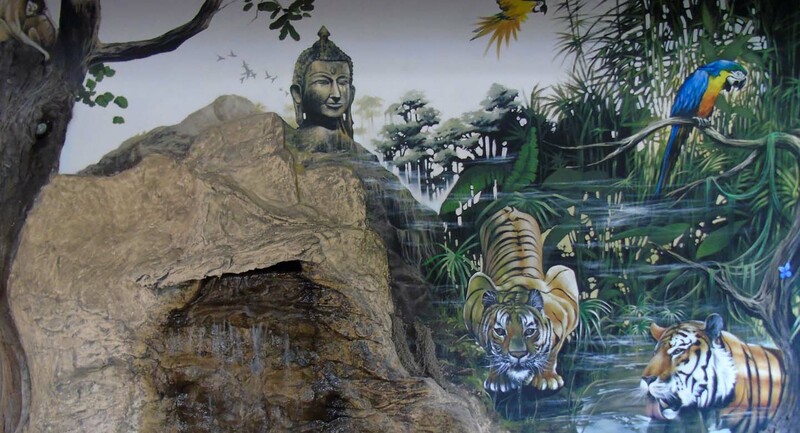 Franck and Carolina are two French artists now based in Samui, their specialty is the trompe l’oeil effect, the rock fills and all kind of decorations. 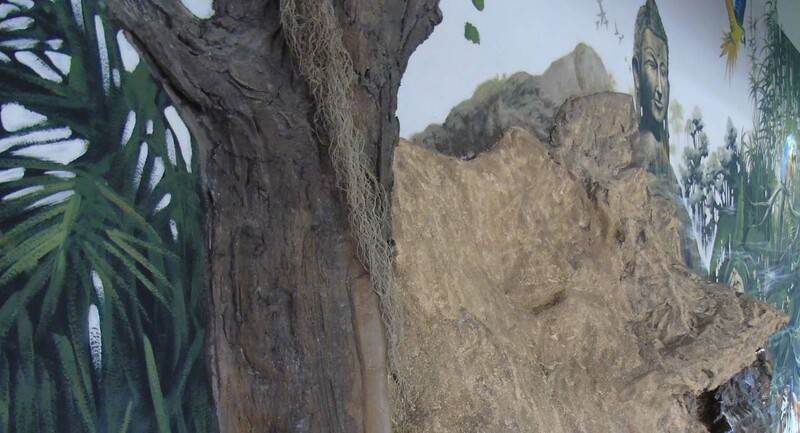 They have a 36 year experience and their artwork is famous all around the world. Besides decoration, Franck and Carolina are famous painters. Carolina has a wide range of scultpures, paintings masterpieces in her collection. She also helped and supported other painters by creating an art Gallery in the South of France. Franck worked as copyist and painting restorer for Louvre Museum. Between 1978 and today, he participated in more than 200 exhibitions throughout the world, in the most famous international galleries, from Tokyo museum to Paris. Franck & Carolina’s expertise quickly spread over Samui Island and Khwan Beach Resort offered them carte blanche to design a one-of-kind atmosphere in the villas. Enjoy their skills looking at the fresco on the outside villa wall, in the bathrooms and on the every inside wall.